There are plenty of people who spend their lives searching. They are looking for the best job, the finest partner, or a hairdresser who doesn't make them want to slit their wrists. Then there are a few bold souls who are hunting - hunting for that most noble confection, a perfect vanilla slice. So, fellow hunters, put down your spears. It's time to give up the chase for a while and start a-gathering, because there is a slice hereabouts that is the most worthy to date, and it's lying in wait at The French Lettuce. The pastry is crisp without being burnt or overly flaky, the custard isn't gelatinous, but smooth and sublime with a true vanilla taste, the icing sugar is real and complements the filling, and the whole thing is just difficult enough to eat to know it's authentic without being an ordeal of sawing forks with a bib requirement (unless you're an utter grub). But beware! It's tremendously difficult to leave the bakery with just your delectable slab of heaven - The French Lettuce has an array of other fresh delights which will make you want to spend your entire salary from you perfect job, and some extraordinarily engineered wedding cakes that will have you proposing to the very first person you see. Why? 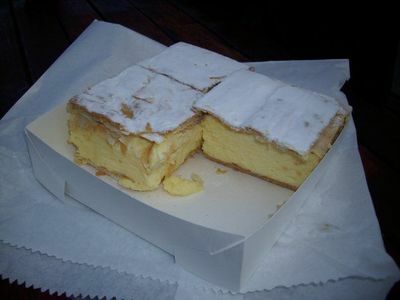 It may well be the best vanilla slice in the city. As a local, I have admired the window-display at this place for a while, without ever having gone inside (it always seems to be closed when I'm walking past). I will be sure to correct that sometime this week. Those vanilla slices look so sumptuous. Ok, so all in the name of research for weekednotes (of course) I ventured into the French lettuce yesterday and purchased a take home pack of 2 vanilla slices to share. Brought them home, popped on a cup of tea and opened them up, they looked much the same as any other. Took a sharp knife, cut into them, only then did the crunch let me know we were in for a treat. Oh yes, I've tried lots (including sorrento), I think these certainly are the best. They were great, crunchy yet custardy (rather than creamy) in the middle, dusted with just a little icing sugar. Yes, we even licked at the plates. Definitely worth the visit, thanks for the heads up - great! Glad to point you in the right direction and glad you enjoyed them! 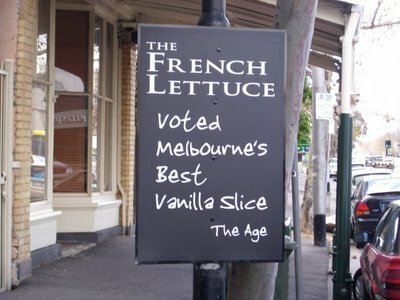 Have also tried Sorrento (take this vanilla slice hunting lark seriously) and French Lettuce is by far the best to date!